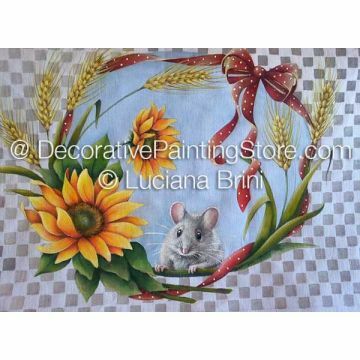 Summer design with sunflowers, wheat shafts, ribbons, and field mouse. Painted on fabric. Enlarged or reduced to fit your surface. Luciana has painted the design on a fabric panel which she said is used to decorate the handle on an oven door in Italy and is changed for the seasons, but it is adaptable to a variety of surfaces.